A Colorado man who claims Facebook(s fb) falsely told his friends that he “Liked” USA Today(s gci) has filed a lawsuit seeking at least $750 for himself and every other user who appeared in ads for products they never endorsed. 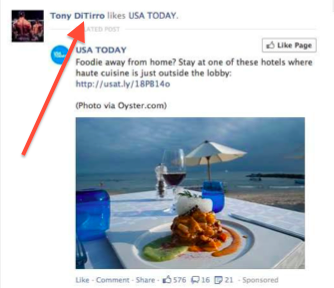 According to Ditirro, he never clicked his “Like” button on USA Today’s Facebook page or even visited the publication’s website in the first place. “Although PLAINTIFF has nothing negative to say about USA TODAY newspapers, PLAINTIFF is not an avid reader of USA TODAY, nor does PLAINTIFF endorse the newspaper,” says the complaint. The lawsuit states that the phantom Likes violate a series of state and federal laws related to privacy and publicity rights, and cites a California law that lets people seek the higher of $750 or actual damages if someone uses their image without permission. The newest lawsuit is just the latest in a long-running legal headache for Facebook over the way it leverages users for advertising. Such ads are highly effective — Facebook COO Sheryl Sandberg at one point testified that they are three times more valuable than a regular ad — but Facebook has repeatedly botched the legal requirements for obtaining permission. It recently agreed to pay $20 million to settle an earlier class action over so-called “Sponsored Stories” (the settlement is still under appeal). In other words, Facebook appears to be expanding, not limiting, its use of users in ads. This story was corrected 1/11 with the correct spelling of Facebook COO Sheryl Sandberg’s name as well as her correct title. He didn’t press the button without thinking – same thing happened to me! I “liked” HMO Harris Bank’s facebook page over a year ago as a favour for a friend who entered a contest. Facebook has been “recycling” my likes and showing that I “Like” that bank’s sweepstakes posts ever since. I had no idea until my Mom asked me why I was “Liking” all their posts! It’s crazy but actually happening. Am reading that even dead people are still “liking” things on facebook after they die. Been having the same problem, “phantom likes” as you appropiately named them, are popping up on my profile. I see on the facebook Help community a lot of people have the same problem. Read an advice, so today I went in Account settings, turned off permissions for all apps to “post in my behalf”, and I’ll see how that goes. I’m thinking he probably just clicked the ‘Like’ button without paying attention, and now wants to make a quick buck with a frivolous lawsuit. “Facebook VP Sherly Sandberg”? Don’t you mean “Facebook COO Sheryl Sandberg”? I’ve often suspected as much in my own experience. You? i don’t know if a lawsuit is necessary, fB should have just fixed this when we started asking our friends “WTF?! u endorsed WalMart? !” but, usually if you don’t take responsibility and self-correct, yeah, someone’s gonna sue! Certainly he’s suing based on principle rather than for monetary purposes. $750 wouldn’t be worth the headache to go through litigation. I detest frivolous lawsuits every bit as much as the next guy, but Facebook is going too far by falsifying information, they deserve it. THAT was bound to happen! I always warned my friends when they “liked” something that put their endorsement on a product that i know they would NEVER EVER endorse! This guy should meet up with America’s Favorite Serial Litigator, Jonathan Lee Riches. Between Riches suing inanimate objects, and this idiot, think of the comedy! You think if Facebook decided to put a thumbs up on a profile of a person who is Muslim, and it thumbed up a recipe for the best baked pork chops and it was seen by all of this connections– this would be funny? You see we like people like you, because we can go in your Facebook messages and read all your info and take it all and slams u with ads, till the cows come home ! As long as their are people like you.. there is a plenty of money to be made.